All Air Jordans are 100% authentic from the original manufacturer. Sole Survivor LLC do not sell or consign factory variants of any manufacturer brands. 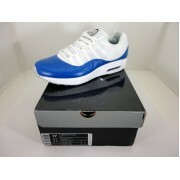 Jordan CFMT Viz Air 11 Color: White/Black/Royal Size: 11.5 A Jordan Brand fusion with th..